Poor mountaineer barely kept his family fed….. The question I’ve been asking myself is, WHY? Why do I have the theme song from the Beverly Hillbillies running through my head? But now, all of a sudden, in a brief flash of brilliance, I know the reason! For those of us suffering through colds and flu, I think what we really need is a good swig of Granny’s "cold cure". Granny made her famous cold medicine from corn squeezins’ in a still at the back of their mansion and after a good belt, your cold would be gone in a week to ten days. I’m guessing my subconscious is telling me to get out the jug. If my cold isn’t gone, at least I’ll be happier when I cough! Now that I've solved the mystery of why I've been humming a TV theme from the 1960's, I can move on to something more current. 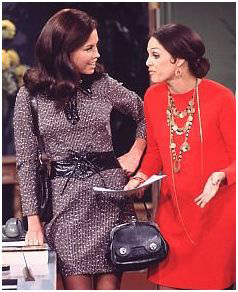 Mary and Rhoda always make me feel better! And Lou, and Ted, and Murray. Somehow, reality shows and crime investigation aren't something to watch when you're not feeling well. Like comfort food, we need comfort TV and a bit of nostalgia. Bundle up, grab a jug, and watch a few oldies. You'lll feel better in no time.